There’s too much time. That’s the first thought I had when Saquon Barkley went flying through the air and into the end zone to give the Giants a 31-30 lead with 1:08 left in the game. I actually had that thought when it looked like Russell Shepard hadn’t been touched as he went into the end zone on the play before, but thankfully, he was down and the Giants could run off more clock before Barkley scored. I know you score when you can score, especially against a defense like the Panthers. You can’t bank on the idea that you are going to get into the end zone, but when it comes to the Giants and their defense late in games in recent seasons, you know that no lead is safe even if there are just a few seconds left in the game, let alone more than a minute. 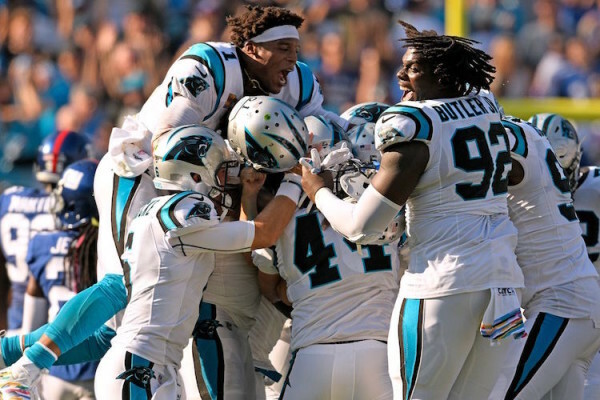 Sure enough, the Giants defense let the Panthers get into at least Hail Mary range with six seconds left in the game, and no one really thought they were in field-goal range, except Ron Rivera, who sent out Graham Gano for a 63-yard attempt. And of course he drilled it and might have been good from 70 yards as the Panthers handed the Giants a crushing 33-30 defeat to drop them to 1-4 on the season. The game should have never come down to a 63-yard field goal to possibly destroy the Giants’ season. In typical Giants fashion, the Giants simply gave the game away, and the officials did their part as well by handing out 15-yard penalties for non-penalties, completely changing the game in the process. Prior to the game, I tweeted that I was done supporting Odell Beckham Jr. I had gone out of my way to defend him being a Giant because of his on-field talent, and that when healthy, he’s the best wide receiver in the league. I have looked away when he has had his on-the-field meltdowns and sideline meltdowns and when he has done everything other than be a team player or a leader because of his talent. But after receiving a $95 million contract, including $65 million in guaranteed money, for him to give the interview he gave leading up to Week 5 was the final straw. Beckham might be the best receiver in the league, but aside from a one-handed catch four years ago in Dallas and thousands of yard in losing seasons, he’s never done anything to earn the right to speak out against his quarterback, his teammates and the organization that just made him the highest-paid player at his position. Right away, my jumping off the Beckham bandwagon paid dividends as he dropped a wide-open catch on fourth-and-3, turning the ball over on downs. The Giants had just gone down 7-3 in the game and his inability to haul in what should have been an easy catch for the highest-paid wide receiver in the league turned the ball over. The Giants defense stepped up and got a three-and-out from the Panthers and Beckham went out to return the punt with a chance to give his team good field position for their next possession and erase his significant drop. As the punt approached the ground, Beckham moved to his right to allow the punt to fall in, choosing to throw an unnecessary block instead. The ball hit his leg and rolled around near the Giants’ goal line, eventually getting jumped on in the end zone by the Panthers. Beckham given the Panthers the ball on downs and the very next play he was involved in gave the Panthers seven points on his poor choice. A couple possessions later, Beckham threw a touchdown pass to Barkley on a trick play, and he would even score his first touchdown of the season in the fourth quarter to bring the Giants closer to a comeback. He finished the game with eight catches for 131 yards, and I’m sure he thinks he did his job, and isn’t bothered by the fact that he did as much harm as good in the game, and possibly even more. Judging by everything he has done since the one-handed catch in Dallas, Beckham thinks his team let him down around him and not the other way around. The Giants had their chances to win this game and not let it come down to a 63-yard field goal. But they’re the Giants, and that’s Giants football. It has been my whole life and I don’t expect it to ever change, no matter who the quarterback is, who the coach is, who the general manager is or what roster and personnel the organization puts together. The Giants have been given a gift by the poor play across the NFC East and despite being 1-4, they are only one game back of both the Eagles and Cowboys. Their rivals have let them hang around with a chance to save this season and make something of what should already be a lost year. Will the Giants capitalize on the second life given to them when they host the Eagles on Thursday Night Football in Week 6? I doubt it. This is the New York Football Giants we’re talking about after all.